Primary Tube Size*: Please Select 1 5/8" 1 3/4"
What makes our header build kits the choice of top fabricators? •Flange Stubs – Included with our SBC header kit are (8) formed stubs to help speed up your fabrication process. These flange stubs are formed to the exact flange shape and come in 1 5/8” or 1 ¾” primary tube sizes. •Mandrel Bends - We supply (8) 180 degree J bends and (4) 180 staggered leg bends. Our J bends come with a 6” & a 12” leg. For most header builds, this extra leg length mean you won’t need to buy any straight tubing. We also supply (4) shorter staggered leg 180 degree bends used for those minimum length applications. What makes our stainless mandrel bends truly a unique product? We start off with an American made 304 stainless raw material, that is then bent in the U.S. for a genuine 304 stainless bend. Our material forms better, welds better and last because it is a genuine 304 stainless. •4 Into 1 Collectors - From there we supply a precision formed 4 into 1 collector or a set of our optional super high flow slip on merge collectors. Just like our stainless bends, we start off with an American made 304 stainless and fabricate the industries finest collectors. Since the merge portion of our formed collectors are roughly 3”, they can be shorted for those tight configurations found on most up and forward turbo applications. •Heavy Collector stars – A simple part that really helps speed up the fab process. Used as a weld in block off between the 4 tubes before welding the collector on, there are precision laser cut for a perfect fit between your specific primary tubes. 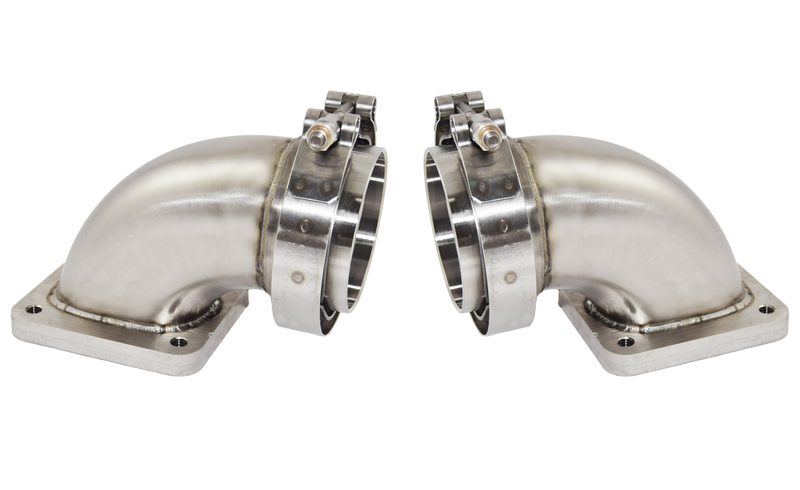 For our turbo build kits, we offer a heavier, 3/16” thick stainless star. •Purge Caps – This simple, but effective method for back purging caps works great. Each kit includes 4 primary caps and one collector cap. We are the first in the industry to offer a header how to video as part of our header build kits. There is a wealth of knowledge included on our instructional thumb drive. Quite a few tips and tricks that are not featured on our YouTube channel. This is the perfect companion to complete your header build kit. Do you have an out-of-round port on your flanges, but are unsure of how to get your header tubing to fit? Check out the video below for our flange kits. Many of our flanges are now available with stubs formed and welded in for you, saving you time and energy on your next header build. Check out our flange kit page for all available options.